← Sony A950/ A99? Following A33, A55 & A77? Recently, I have been quietly picking up stuff from used gear stores & eBay. Looking at the old stuff that I had collected the last few months left me a conclusion, cameras & lenses has a better built quality in the past than now. You don’t have to agree with me, but let me share what led to this conclusion. These 3 cams got me venturing & understanding deeper into “film culture”, which I soon followed up with a BlackBird Fly – a plastic TLR (Twin Lens Reflex) camera, a Canon EOS 5, EOS 88, a Minolta Dynax 5, a LubitelII, a Lomo FishEyeII & the latest addition being a Nikon F90X (also known as F90s in US) & a digital Nikon D1X from 2001. I have spent considerable time with each and every cam above and I found 2 things very interesting, film mechanism are fun to meddle with and old cams has very solid construction. These cams (apart from the BlackBird Fly & Lomo Fisheye which are the remake editions of the actual models) have very simple design and basic function (much lesser functions as compared to the newer digital camera) but hey, they works like the way they should and when handled, these cams feels like they will live forever! They produced excellent film photos! If by now, you are still not sure about cameras of yesteryears, visit your local used gear dealers and pick up one that’s launched before 2000. A Film SLR is a good way to start. A classic cam in your dry cab also starts conversations. Lastly, I came to know that the Yashica MG-1 was launched & bought in the year that I was born, on this day in 1975. My Dad bought it to shoot his first born, that’s me. *Read my review on Yashica MG-1 in the archive. On a totally unrelated note, I found this photo on the internet & I would like to share it here. 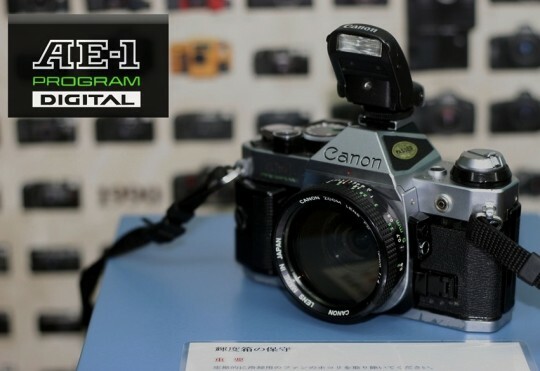 It’s a 1980s Canon SLR, the famous AE-1 Program – but with a twist. 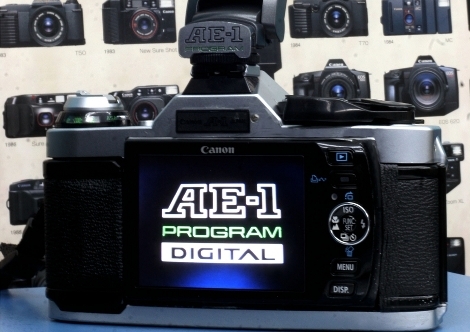 AE-1 Program with Digital Back & LCD Screen? No F**king Way! But check out the next pic! This entry was posted in Photography Articles & Videos and tagged Canon, Film, Lomography, Nikon, Olympus, SLR, Yashica. Bookmark the permalink.